Apple Array Practice for Second Grade - Look! We're Learning! One of Pooh’s objectives this year is to learn to work with arrays. When I was in school, we weren’t using arrays. We were memorizing addition and multiplication facts back then. Now, though, arrays are an important (and helpful) way to understand adding and multiplying. So I put together a math product: Apple Arrays! 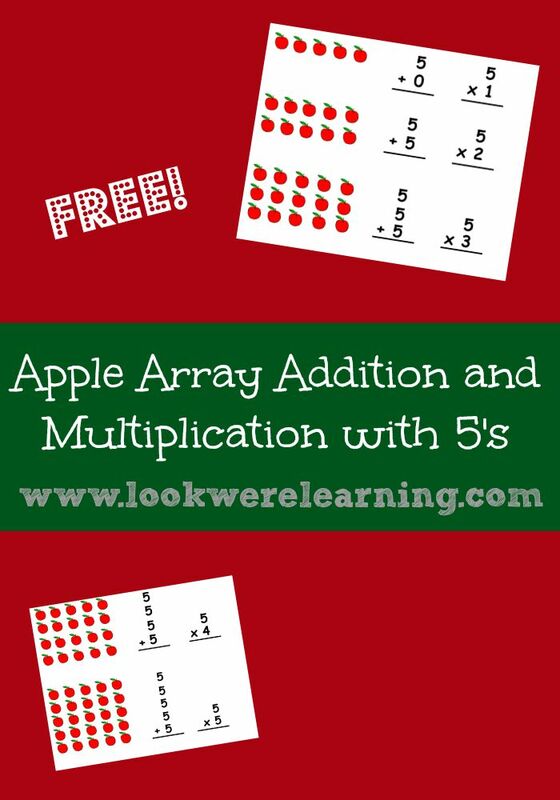 – A fun, apple-themed way to have array practice for second grade! 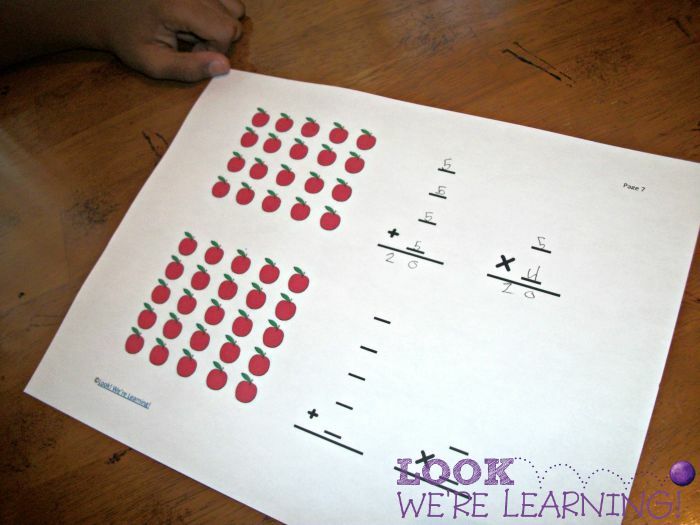 By the way, be sure to check out our Apple Orchard Playdough Counting Mat for your toddlers and preschoolers! 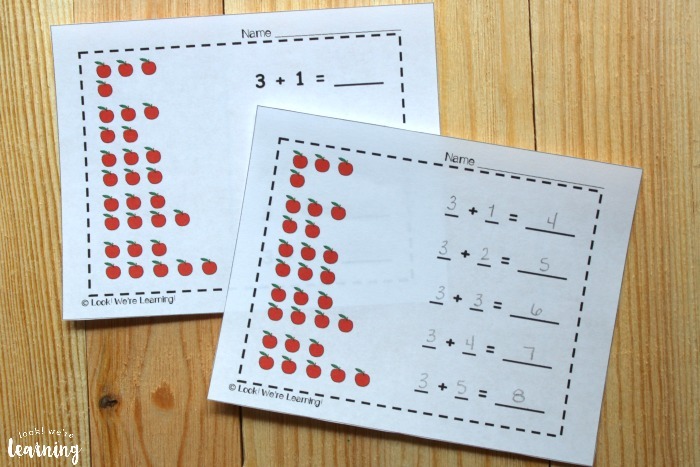 Or work on counting all the way to ten with our Apple Tree 1-10 Counting Mats! 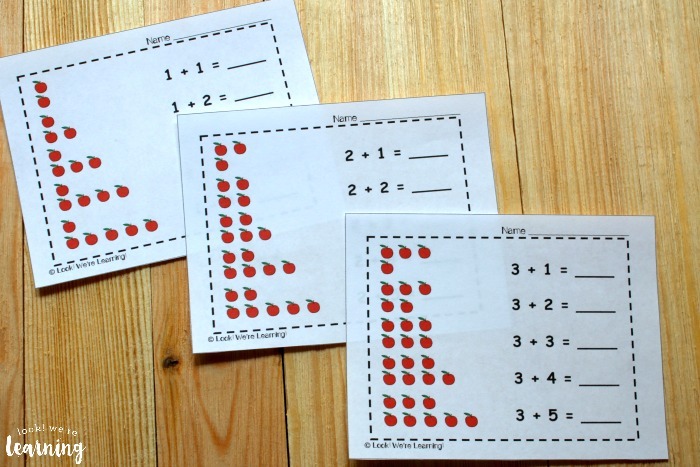 This product includes 16 worksheets that include both addition and multiplication for numbers 1-5. 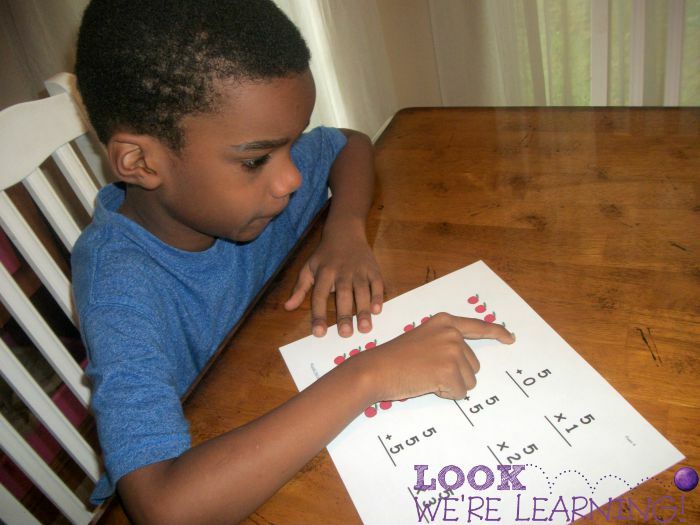 If your students are still working on addition fluency, the first ten worksheets are all about adding numbers 1-5. A full answer key is provided, so the kids can check their work. 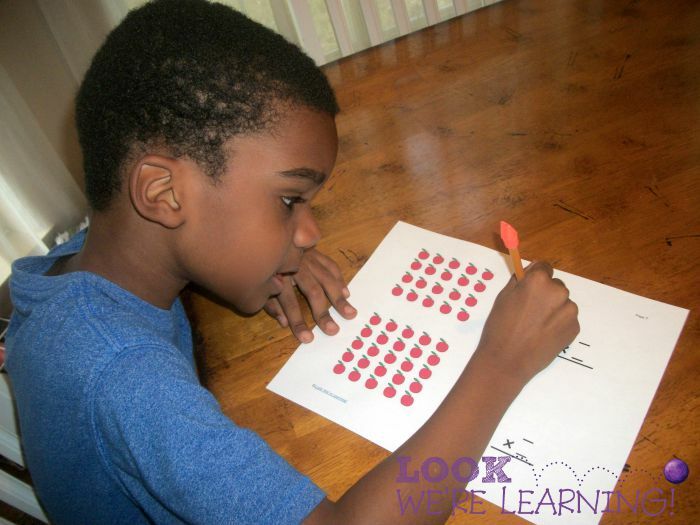 This is a great activity for practicing addition facts. 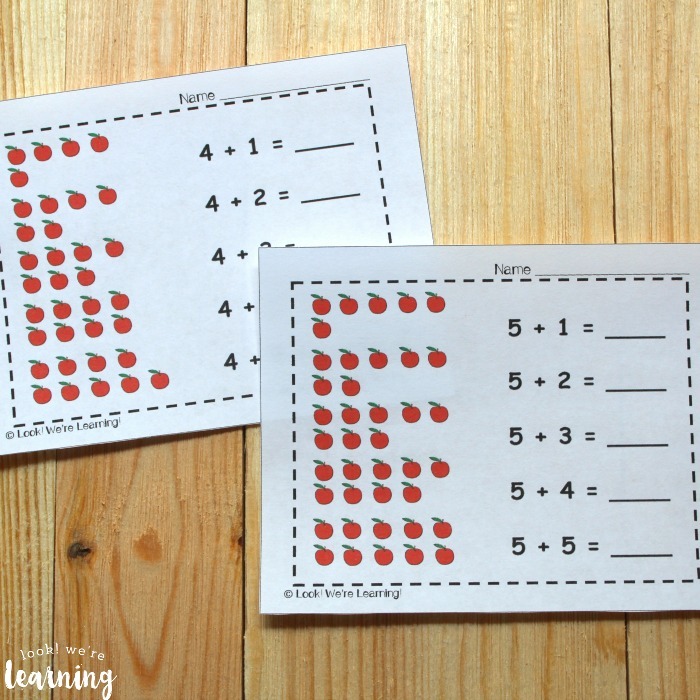 But if your students ready for a quick introduction to multiplication, the last six worksheets are perfect for showing them the relationship between adding and the times tables! I have to admit that when Pooh saw that there were multiplication problems on the sheet, his reaction was “TIMES TABLES??? ?” It was a dramatic moment, for sure. But I used the first few pages to introduce him to using arrays with addition. And then we talked about how that’s the same as multiplication. 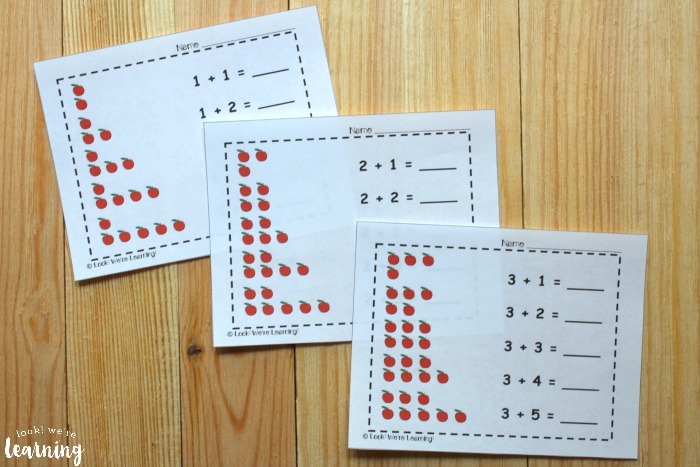 This product focuses just on working with 5’s from 5+0 to 5+5+5, so you can use it to introduce times tables from 5×1 to 5×5. 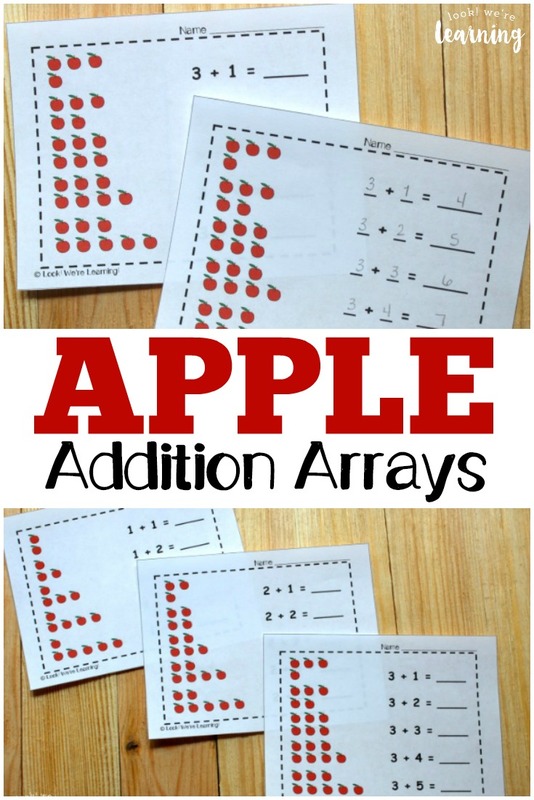 The first set of pages contains apple arrays and written addition and multiplication problems. Pooh and I looked at each row and column in the arrays to understand why we write those particular addition and multiplication equations to represent them. Count out the number of apples in each row to find your first addend. Then count the number of rows to find the second. Simple! After he went through and solved the first set of problems, we used the second set of pages. 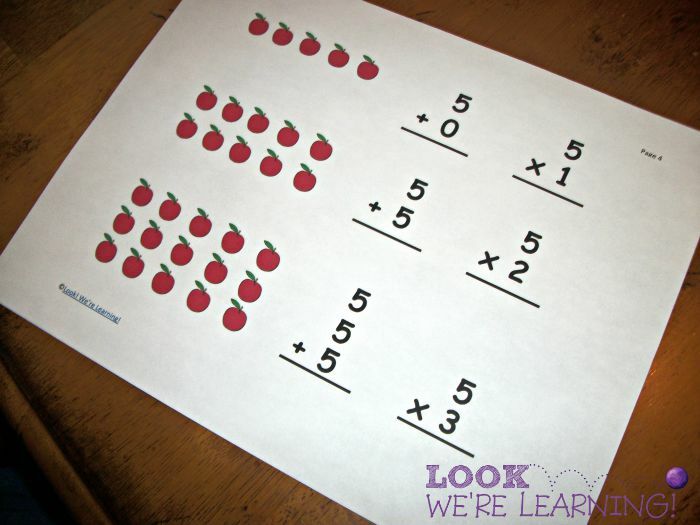 These pages have the apple arrays and addition/multiplication problems, but kids have to read the array correctly to fill in the addends/multiplicand/multiplier. Which he did on his own! He was so excited to grasp how to read arrays and relate them to multiplying that as soon as Jay came in the door, he said “Dad! I learned how to do times today!” Another one of those homeschooling gifts I’m thrilled to share with them this year. 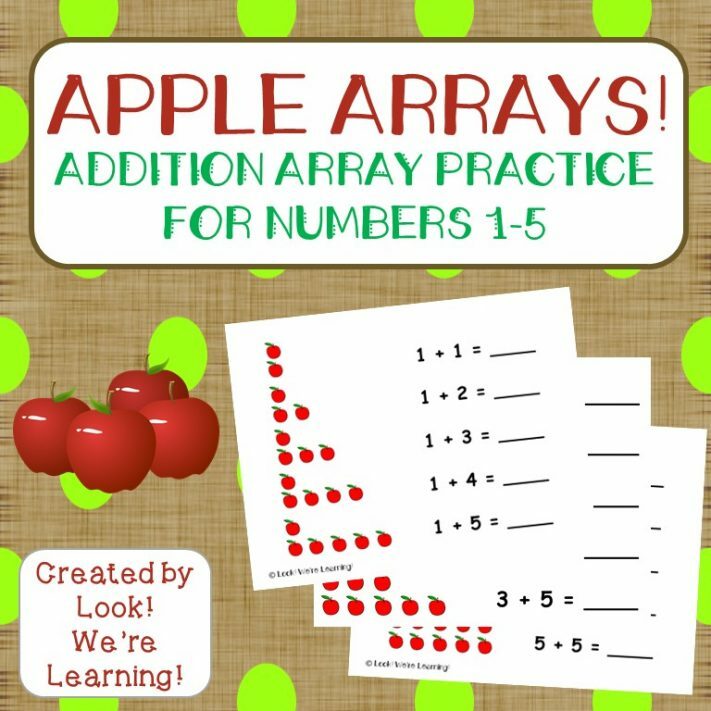 Scroll down to get your copy of our Apple Array Practice for Second Grade! 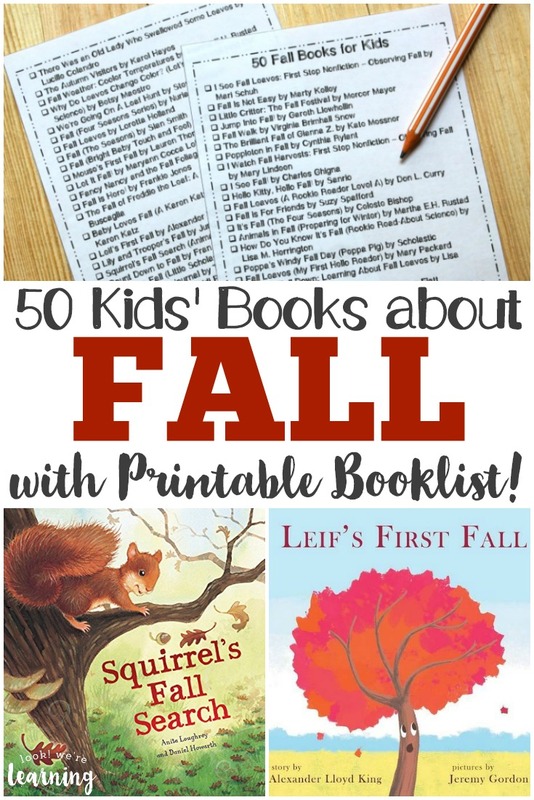 Check out our other fall learning resources! 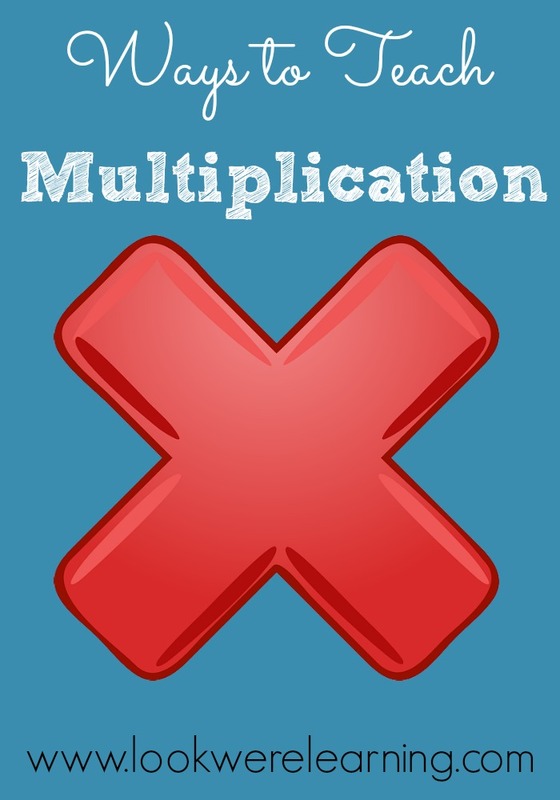 If you need more suggestions for teaching multiplication, try these tips! 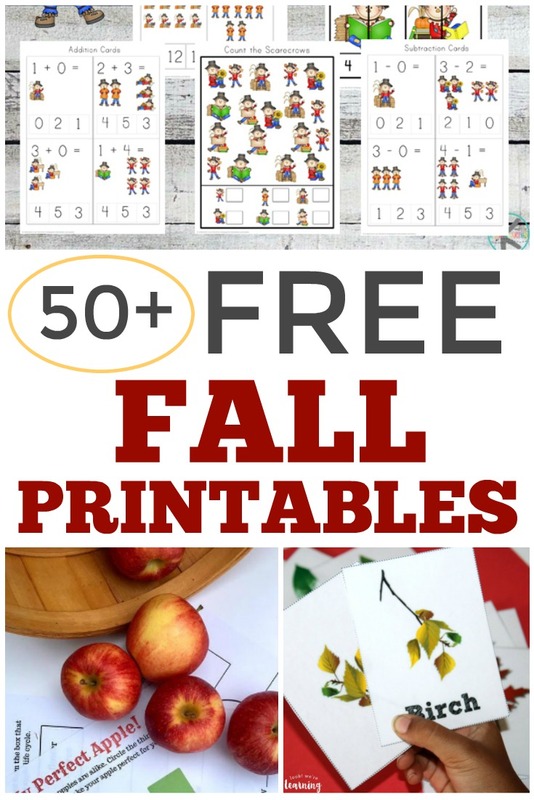 And don’t forget to follow my Math Mania Pinterest board for more math teaching tips! To get your copy of Apple Array Practice for Second Grade, grab our 2nd Grade Learning Bundle! 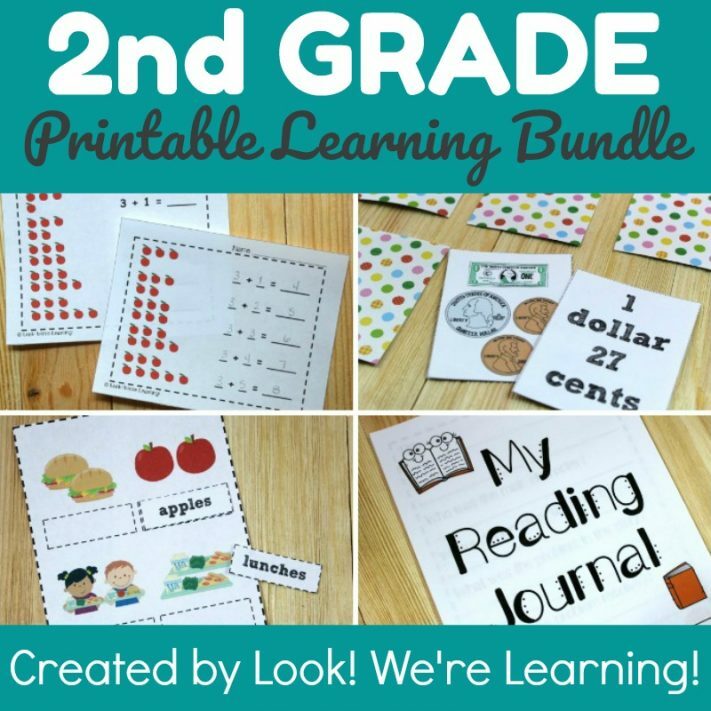 This bundle includes four learning printables designed to get your early elementary student off to a great year! Come along with the entire 2nd Grade Blogging Team for all of our Apple activities this week! I love this a great way for them to learn what they need to know. This math is one of the hardest things and our school system changed up things from the old way of doing math. It’s definitely A LOT different than I remember. I’ve had to set aside time to study the concepts myself before I can teach them, even with first and second grade topics! Oooh, I love the way your arrays compare addition and multiplication!! I’ll totally use them with my daughter! 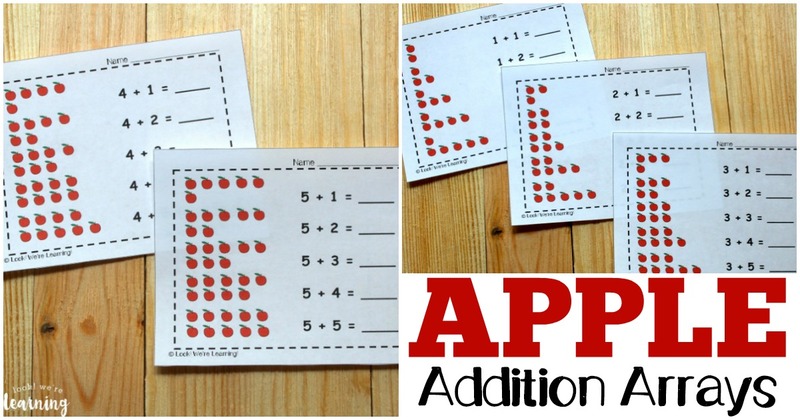 This is an excellent idea to explicitly compare multiplication and addition results! I’m looking forward to having a go at this with my son soon. Thanks, I hope he likes it!